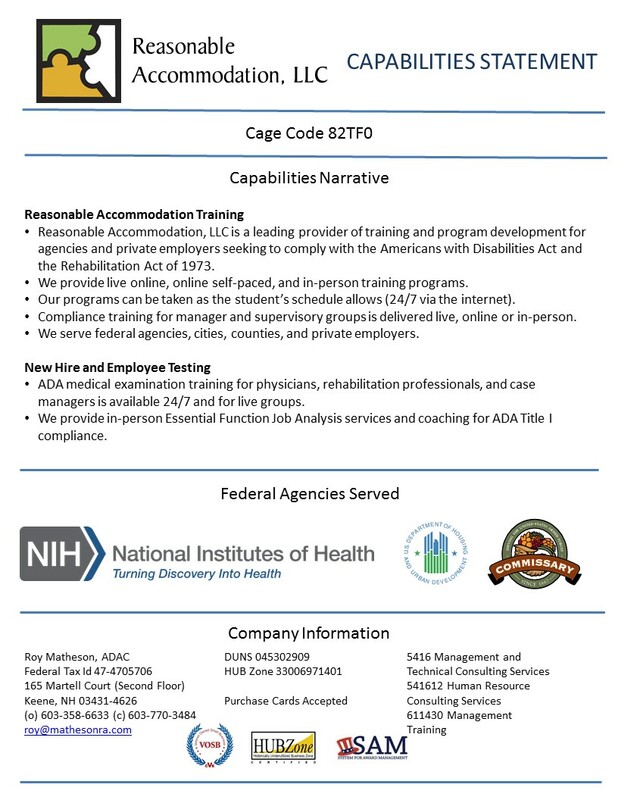 Reasonable Accommodation, LLC is an advisory and training firm immersed in the mechanics of Title I (Employment) of the Americans with Disabilities Act (ADA). Roy Matheson is an Americans with Disabilities Act Coordinator (ADAC) with thirty-five years of pioneering and training experience in the field of occupational rehabilitation. The Reasonable Accommodation team supports private employers, local government agencies, legal counsel, and aggrieved employees in the areas of employment testing and reasonable accommodation. Our specialized management training programs meet the annual training requirements of cities and counties that belong to risk compacts. Our ADA Title I medical examination training programs for work evaluators, physicians, and legal counsel offer essential insights into employment testing clinical practices under the law. Roy and Len Matheson, Ph.D., were co-founders of the Employment and Rehabilitation Institute of California (ERIC) in 1984, the nation’s first full-service industrial rehabilitation center. Providing work capacity evaluation, functional capacity evaluation, and work hardening services, the clinic became a model for hundreds of similar programs throughout the United States and Canada. In 1988, the ERIC clinical program and the growing training programs were organized as separate business entities with Len directing the clinical work and Roy directing the training. Roy Matheson and Associates, Inc. (now ‘Matheson Training and Education Solutions, LLC’) provided post-graduate training to more than 15,000 occupational therapists, physical therapists, ergonomic evaluators, physicians, and psychologists. As the resident ‘guru,’ Roy developed a highly respected cadre of trainers and mentors. This renowned group of expert work evaluators and ergonomic evaluation professionals reside in the highest echelon of expert witness providers in the United States and Canada. Their on-going training programs share the Matheson philosophy and Dr. Matheson’s evaluation standards in countries across the free world. Since 1983, Roy Matheson and Dr. Leonard Matheson have earned excellent reputations as teachers, professional mentors, and program development consultants as they remain actively involved in moving forward their fields of practice.